Here we are, officially half way through a year of menu ideas. It wasn't so hard - was it? All it takes is a little planning and a little organization. With no homework or afternoon activities to coordinate, summer menu planning can be easy. My plan to make summer menu planning even easier, is to grill as often as possible, stick to lots of fresh (local) ingredients that don't require a lot of prep and think "outside the box" for what makes a "dinner". 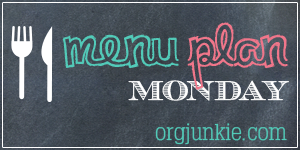 This Meal Plan is linked up at I'm An Organizing Junkie, for Menu Plan Monday.